Marketing and Sales share the responsibility of finding new profitable customers. To attract new customers, the sales and delivery teams must be able to articulate the business benefits. These groups often rely on marketing to create the processes and tools that enable the sales team to fine-tune and accelerate customer acquisition. These sales enablement tools help the sales organization improve their effectiveness at generating revenue and earnings by giving salespeople the right information at the right time to increase their rate of success. Marketing and sales need to collaborate with each other to ensure appropriate materials and tools are created and properly distributed. Examples of sales enablement tools include tracking and disseminating best practices, providing case and use studies, and more recently creating playbooks and crafting personas. More and more, organizations are leveraging personas. Personas strengthen your demographic and psychographic customer data with more qualitative information. Personas represent the needs of larger groups of customers, in terms of their goals and personal characteristics. Think of them as ‘stand-ins’ for real customers. A persona seeks to zero-in on ‘customer’ behavior and characteristics. An effective persona concisely describes of a specific customer type bringing user, buyer, and influencer profiles to life to help inform content, channel, and touch point decisions. Learn more about how to create powerful personas. A playbook is a collection of tactics or methods. When this definition is applied to business, we are essentially creating a document, the sales playbook, that characterizes the roles and responsibilities for each member of the selling organization, lays out clear objectives for each member of the team to support the business plan, targets setting and performance measurement, and provides a common framework and approach for most effectively developing and closing opportunities. The sales playbook captures your company’s knowledge about its markets, value propositions, offers, competitors, and best practices. These are the very elements that fall within the marketing organization’s domain, which is why marketing plays a strategic role in developing the playbook. Ready to Up Your Game? 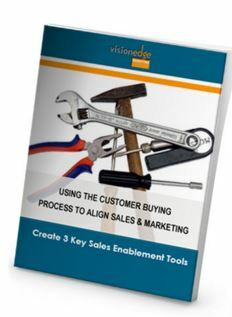 Contact us for help in developing your sales enablement tools, improving marketing and sales alignment, developing playbooks or data-driven personas or for the DIY among you, check out our workbook Using the Customer Buying Process to Align Sales and Marketing & Create 3 Key Enablement Tools. evaluating and improving their Marketing effectiveness. how they do it and access the Free checklist.